The Safety 1st car seat is one of the top rated on the online market – and a true bestseller that is designed to offer you comfort and convenience for every year of using it. Moreover, it is built to grow for extended use through the main three stages which include the rear-facing position (5-40 pounds), forward-facing position (22-65 pounds) and belt-positioning booster (40-100 pounds). That being said, it is safe to say that this is a universal car seat that can be installed in many types of vehicles. From the above mentioned, it is easy to see that the Safety 1st Grow and Go 3-in-1 Convertible Car Seat has everything you need from it. It easily lasts for 10 years and ages with your child. How To Install The Safety 1st Grow And Go 3-in-1 Convertible Car Seat? When it comes to installation, figuring out whether you are going to choose UAS or seatbelt installation is important with this model. Also, it goes without saying that a detailed instruction goes a long way in installing a car seat – which is definitely the case with this model. The user manual is especially important if you are going to use the Safety 1st Grow And Go 3-in-1 car seat in more vehicles, you should know how to properly install it in each. From user-friendly diagrams to color-coded sections, there is great detail in this manual which makes the installation process a breeze. For many, the step one in installing the car seat is going around the UAS connector belt and figuring out how it works through all the right belt paths. 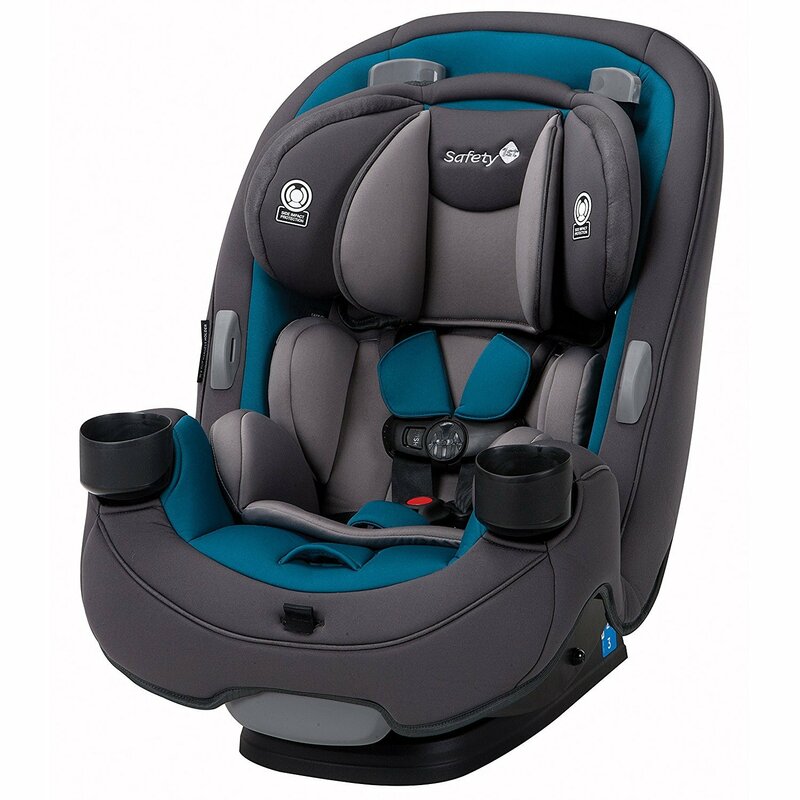 In the Safety 1st car seat, this is very simple for both rear and forward facing installations. For example, if you are installing the car seat in the rear-facing position, all you need to do is adjust the recline of the seat and ensure that the level on the side is parallel to the ground. On the other hand, if you are positioning it in the forward-facing mode, you need to align it with your seat. Once you do that right, it’s time for connecting the UAS connectors to the anchors and tightening the UAS belt which is again a process without any difficulties. If you have any difficulties throughout the process, though, you can check out the video below and replicate the steps. The video above perfectly shows the quality of the car seat and the amazing build of it. Also, it shows how adaptable the car seat is for different vehicles. Still, you should take a look at your vehicle’s manual before you purchase it and make sure that this car seat is compatible with your car, SUV or van. In the seat belt installation case, the process is even easier and seamless whether you want to configure it for forward-facing or rear-facing. The paths on the car are color-coded (as shown in the manual) which makes it easy to figure out where the seat belt should feed through. 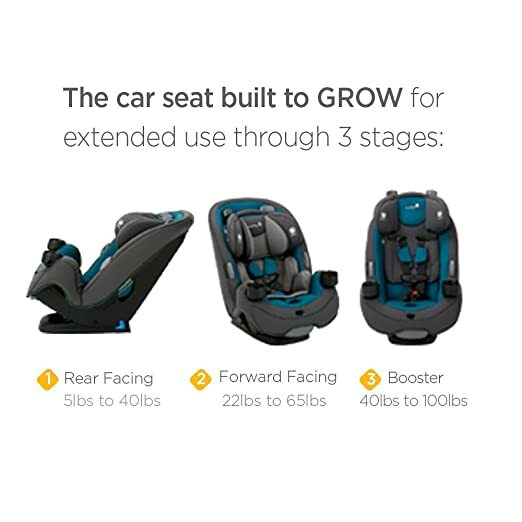 As you already know, the Safety 1st Grow And Go car seat is made to be convertible with a good reason – to help you stick to choosing one car seat instead of buying three different models as your kid grows. The structure and overall build is long-lasting which gives you a 10-year lifespan. Below, we are listing the main benefits in each position. The initial car seat position of this product is the rear-facing one which aims at babies weighing 5 to 40 pounds. According to the brand, the seat is so comfortable and safe that you can even use the car seat when taking your baby from the hospital. There is a lumbar support pillow and a head support pillow – both of which are great – and both of which can be removed later on when your baby grows out of them. However, you should see this for yourself because in most of the cases, newborn babies are too small to be covered with straps from armpit to armpit. The second stage is the forward-facing ride which is recommended for children weighing from 22 to 65 pounds. Basically, the kid can stay in this position until they weigh 65 lbs. However, the point when you start putting them forward facing is fully up to you. According to the American Academy of Pediatrics, this should happen when the kids are at least 2 years old or until they exceed the height or weight limit of the car seat. For many, this is a position where the car seat is in its ‘best years’ and at this age, the kids are really happy for the features such as cup holders and shoulder pads. Last one of all is the booster position, which is a position designed for children weighing from 40 to 100 pounds. This is a belt-positioned phase where the back doesn’t come off which means that it is still a high-back booster chair. Used by older kids who need the help of the seatbelt or a car fit, this position allows comfort and convenience. And if that is not a case in your experience, you can remove all the extra padding and the five point safety harness system so that everything that is left is the seat alone. 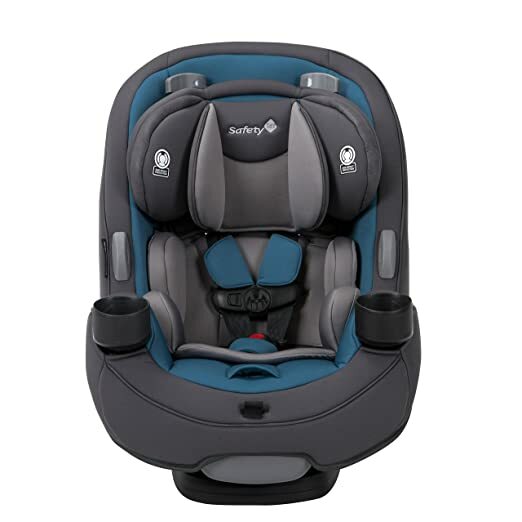 Overall, the Safety 1st Grow and Go car seat is very easy and simple to use. The chest clip and buckles do not cause any pain or pinching. And while some parents say that the chest clip is a bit stiff and the five-point harness buckle requires some strength, the features are designed that way so that little kids cannot escape from their car seats easily or figure out how to unfasten themselves. Obviously, the biggest advantage of this car seat is the easy-to-adjust harness height system. If you are using the car seat with a newborn baby, this feature is the thing that will reassure you in terms of safety and protect your baby. The body pillow, re-threading and lower shoulder harness slots should adjust to the placement of the buckle in that case – and your little one needs no re-threading. The frame of the seat is lightweight which makes it portable and energy-absorbing in a crash. The fabric is on the pads and pillows and has a tight weave that is smooth and soft. The pads and pillows are easily removed when you need to wash them too – and machine washable on a gentle cycle. 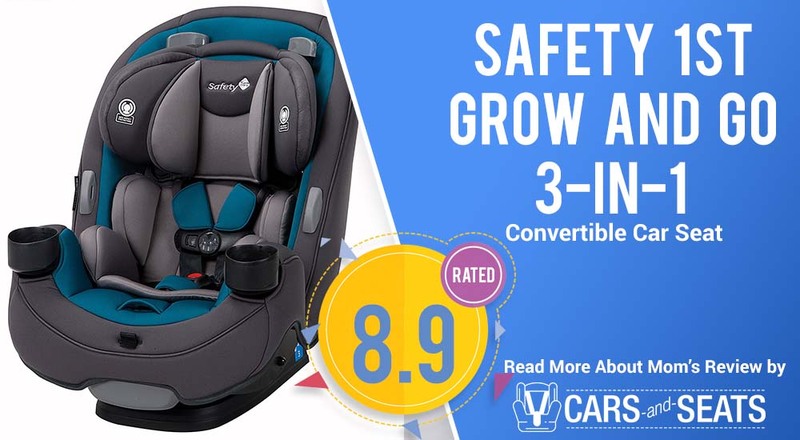 To wrap things up, we are listing the main advantages and disadvantages of the Safety 1st Grow and Go 3-in-1 Convertible car seat. Needs manual adjustments for newborn or smaller infants with add-on shoulder pads etc. Our advice is to always check your vehicle’s compatibility before purchasing a car seat – something that also applies when it comes to this product!